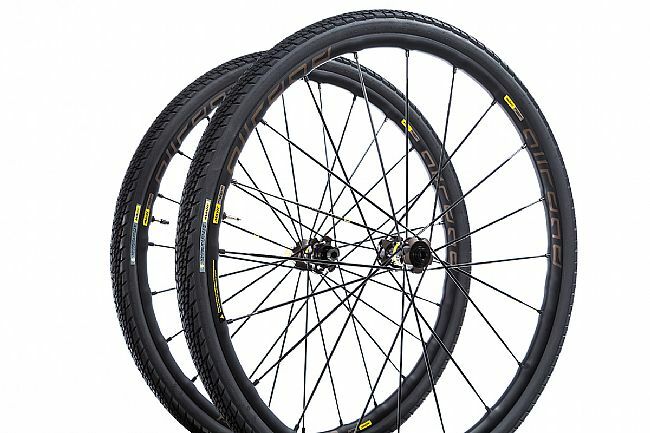 Mavic's new 2018 Allroad Pro UST Disc Wheelset is all about opportunities. Ride the way that you choose with this strong and fast wheelset, featuring an extra-wide 22mm internal rim width for compatibility from 32 to 64mm wide. 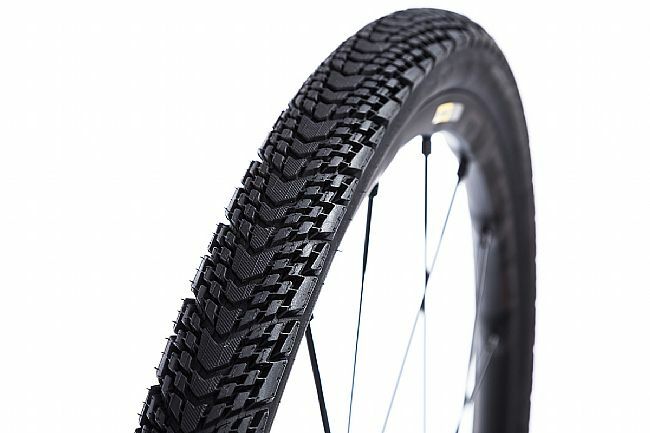 This extra bit of tire width means that whether the day's ride calls for asphalt, gravel, mud, or sand, these wheels will keep the spinning and giving you ample support. 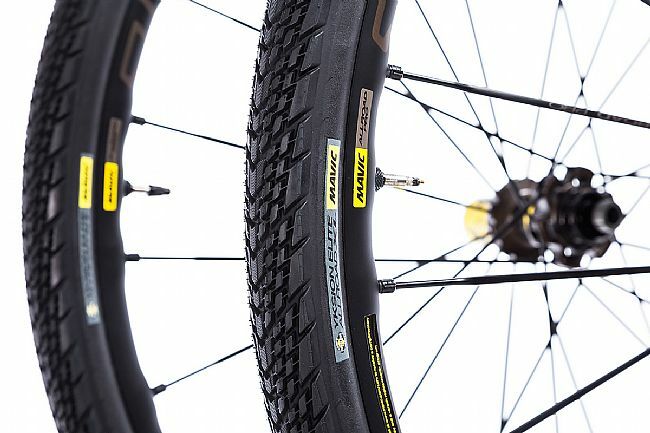 Featuring Mavic's wheel-tire system, the Allroad Pro rim is UST compatible, meaning it's easy to install, safe to ride, pinch flat-proof, and easy rolling. 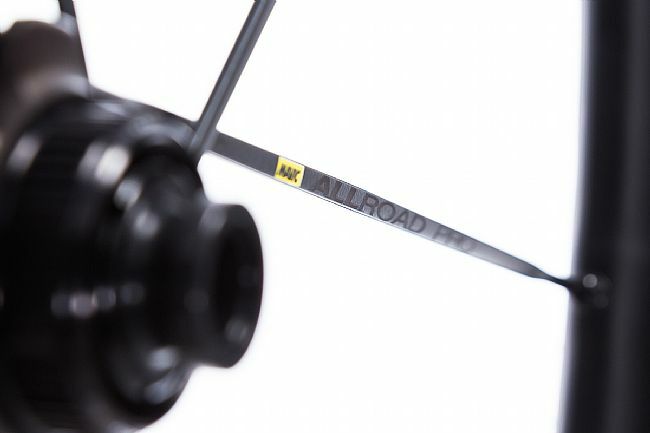 From hard-packed dirt to washboard gravel, the Allroad Pro features a disc brake-compatible hub (either 6 Bolt or Centerlock) for powerful, reliable braking in all conditions. 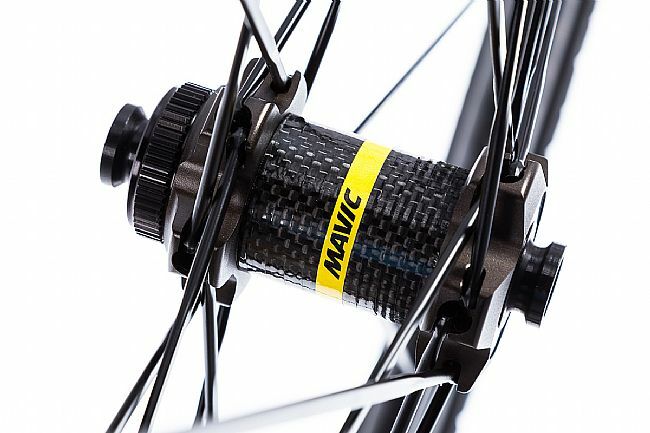 The Mavic 2018 AllRoad Pro Disc UST Wheelset is compatible with disc brakes only. Tubeless ready. 9/12mm Thru Axle front and 12x142mm Thru Axle rear (convertible to Quick Release with additional adapters). Delivered with 700x30c Yksion Elite Allroad tires, Front 12mm adapters, Rear 12x142mm adapters for Instant Drive 360, Tire Sealant, Multifunction adjustment wrench, Specific disc bolts, UST Tubeless valve and accessories, and a user guide. This extra-wide disc brake wheelset is ready for whatever surface that gets thrown at it. 22mm internal rim width is optimized for tires between 32 and 64mm wide. 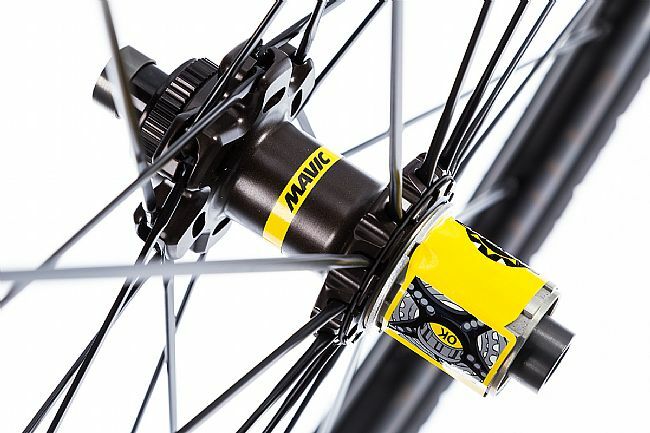 Stable and secure with Mavic's Fore Drilling, making a solid rim/spoke connection. 24 bladed Zicral spokes front and rear. 9/12mm thru axle front wheel. 12x142mm thru axle rear wheel. Available with 6 Bolt or Centerlock compatible disc brake hubs. Claimed weight: 1660 grams without tires. I bought this wheelset when it went on sale at BTD for my cross bike that I use for commuting. I previously was riding on a Ksyrium Pro Disc wheelset because it was bomb proof, but I thought that I'd upgrade to newer technology with winter and rain approaching. First, the downsides. Don't believe the statement that with UST wheels you can get them started with your floor pump. The Yksion Elite tires (I ordered the 35mm version) are unidirectional and marked frontrear - maybe because looking at the tread pattern the proper mount direction was opposite of what I would have assumed. Apparently someone else was confused as well because one tire was mounted in the right direction, and the other was not. I removed and remounted the tire that was not mounted in the right direction and I could not properly inflate it until I used my compressor to inflate the tire and get it to snap the bead properly into the rim. Then I used the adapters that were included to convert to QR (the ones for the front wheel were marked rear wheel by the way). If you do this be careful when you pull off the end caps on the rear hub - when I did it the entire free hub body pulled off and the spring that holds the ratchet popped out. It was easy to put back in though and luckily I didn't lose anything. But once that was done I have to say that I was super happy with the wheelset. The hub is amazing (and super quiet). But it was the ride that shocked me. I'm fairly new to tubeless tires, and I really wasn't looking forward to 35mm tires. I was worried that the ride was going to be slow and mushy. I would have preferred the older 30mm size tires if I had the option. I don't really plan to do any gravel riding and I was concerned that I was going to sacrifice handling and road performance for grip and a softer ride. Now, I'm a data geek, and I track everything - including on my commutes to work and my commutes back and forth to the pool in the morning. So I know exactly what my mileage and average speed is. As I rode with the new wheels and tires I was first pleasantly surprised that is was a great ride, softer but by no means mushy, and the handling was great (although at first I had the weird sensation that the front wheel would pull to the side when turning). But what shocked me was that my ride was actually FASTER than what I had experienced with the Ksyrium Pro Disc wheelset and my road tires (28mm). 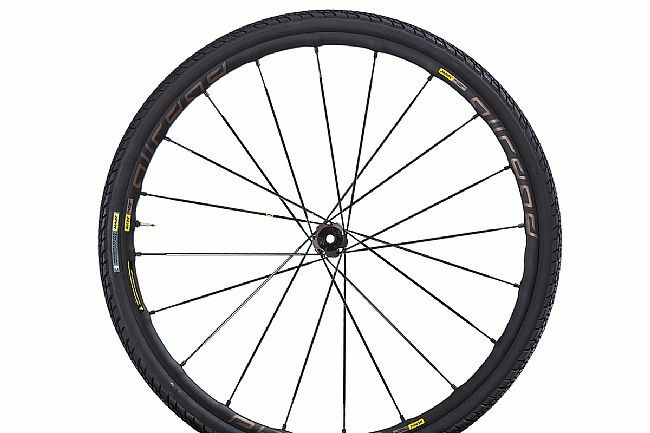 I would recommend this wheelset to anyone looking for a bomb proof commuting wheelset, not to mention someone looking to take their bike off road and do some gravel riding. 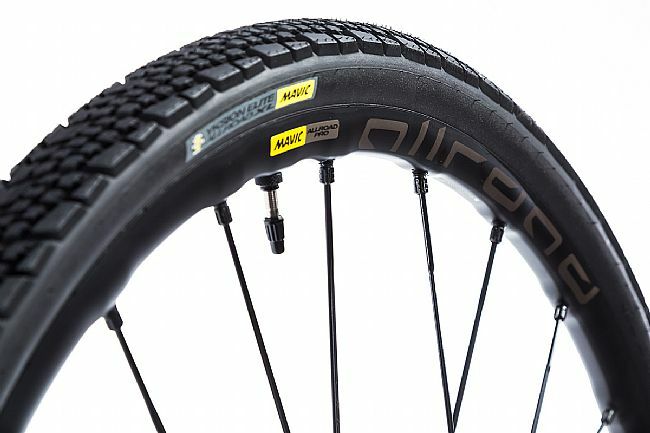 I recently purchased these and even though they came with 40mm Yksion Allroad tires installed I wanted to test out Mavic's UST tubeless. I removed one tire completely and reinstalled it. Seated within seconds using a simple floor pump. As soon as pressure got near 20 psi the tire popped into the beads. Easy as that. I deflated, added sealant, reinflated and it held air perfectly. Hubs are smooth, build quality seems strong, and although not the lightest wheels out there I dropped a full pound and a half off my gravel bike by replacing wheels, cassette and rotors.